Vasu is a corporate EnterTRAINER, speaker, consultant, artist, actor, and TV personality. Vasu incorporates art, drawing, music, design, acting, composition, and improvisation in all his training to expose the creative and expressive side of every participant as they learn and experience new lessons. Vasu believes that people learn best through personal experiences, experimentation, through making mistakes, and through correction. Vasu served as a career Air Defence Officer in the Singapore Air Force as a platoon commander and later as a Battery Commander. He worked primarily with military teams – teams whose survival depended the teamwork of its members. After six years in the Air Force, he left to join Prudential Assurance Company, where he gained much sales and marketing experience selling financial planning products. In 1999 he started a sales and training business. He launched a sales training CD called ‘The Life Agent’s Jumpstart Kit’ and a CRM and e-newsletter service targeting the life insurance industry (agents) in the region. His client base extended to countries like Malaysia, Brunei, Philippines, Vietnam, South Korea, India, and South Africa. He exited the business in 2003. 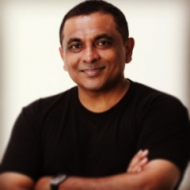 In 2005 Vasu went back to school for almost two years, studying Accelerated Learning techniques, team psychology, and dynamics, improvisation, presentation, and facilitation skills. During that time too Vasu began applying his training and facilitation skills by facilitating programs for schools and adult corporate programs. Being involved with the entertainment and performing arts scene in Singapore, Vasu has participated in the Singapore Arts Festival, acted in short films and full length movies, television and stage work, and has worked with many large production houses in Singapore. He is best acknowledged for his work with the hugely popular ‘Just For Laughs Gags Asia’. In 2010 Vasu, joined a Malaysian-based corporate training company as lead trainer and program developer, specialising in team leadership and personal development training. His programs are always designed with whole-brain learning considerations in mind. His programs are always experiential, relevant, and fun. In the past ten years, he has gained extensive experience as lead trainer in his work with many of the largest Singaporean and Malaysian Government Ministries, MNCs and GLCs, including SIA, Petronas, Digi, Prudential, Cargill, Nestle, and more. Vasu now runs his own human capital development business. Vasu is a certified ACTA (Advanced Certificate in Training and Assessment) trainer and is a certified TetraMap Facilitator. TetraMap adds a new dimension to my training is so many ways.